How about a Salvia 15 feet tall and 30 feet across? Salvia gesneriifolia 'Tequila' does exactly this, covered with thousands of clusters of 6 inch long red flowers with dark, almost black bracts. But that's not what I am writing about today. Not yet in bloom, this one will just have to wait for it's day-in-the-sun. One or two each time is my goal. Today, the earliest of the Winter blooming Sages are the topic. Not that some of these are any less dramatic or special. First up is Mexican Winter Sage, S. holwayi. A spreading shrub that makes an excellent large scale ground cover, it has not started blooming in a big way.Growing to six feet or more high (and yes, it can be kept lower with pruning) and spreading to at least eight feet, there seems to be as many flowers as leaved during it's November to March bloom. Full sun is best, good soil and regular water is necessary for this native to high elevation Pine & Oak forests in Chiapas, Mexico. Did I say this has RED flowers? Fire engine red, in fact. Next come the Roseleaf Sages, Salvia involucrata and it's hybrids: 'Bethelii', 'Haspen' and x 'Mulberry Jam'. Erect shrubs with very attractive foliage, these all have large, upright flower spikes with very prominent bracts. The species is native to the Mexican states of Puebla, Tamaulipas, and Veracruz, growing in shady places such as the edge of forests. They do well in full sun most places, but do tolerate shade. Historically, S. involucrata along with several other members of its genus have been used as a memory-enhancer in traditional herbal medicine. 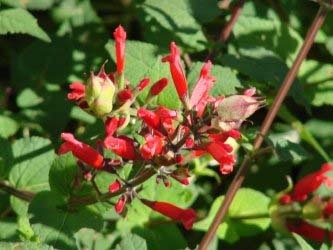 Scientific studies seeking to verify this have shown that extracts of S. involucrata (along with other Salvia species) contained significant amounts of cerebral cortex-relevant compounds. More Winter Salvias soon, and more in the way of cultural hints. Be sure to check our Facebook page for daily pictures. Great company. Large variety of salvias! I am always so pleased with the plant orders I receive from you. Considering you are shipping from the west coast to the east coast, it is remarkable the plants arrive in such good condition. They always are also very healthy looking. Thanks so much for the wonderful Salvias you grow and provide.